I can’t do it, you guys. I can’t muster up motivation to vacuum. We get the keys to the new place tomorrow, and I just can’t bring myself to dust anymore. I just want to clean there and not here anymore. Do you see my point? Do you see that graham cracker bird, right there? So what if the edges got burned a little? Big deal. I promise that when I put some in a jar for you, I’ll make sure that none of the burned edges are in there. And I’ll pick out the cutest birds. And I’ll even put extra peanut butter chips in there because that’s just the kind of girl that I am. *I used a half recipe of my Graham Crackers and cut out teeny birds and baked them for about 10 minutes with no flipping. Preheat oven to 325°. 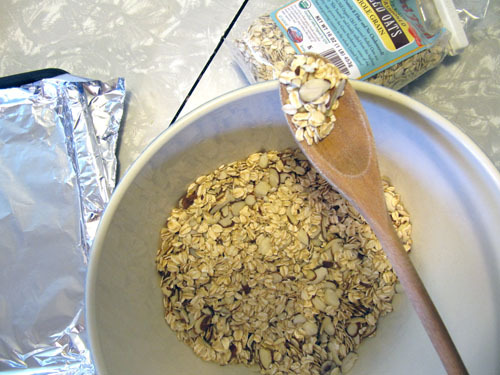 Spread oats and almonds evenly in a single layer on a foil lined baking sheet. Bake 10 minutes. Stir well; continue to bake until lightly toasted, about 5 minutes. Meanwhile, combine the honey, oil, cinnamon, salt and cloves in a large bowl. 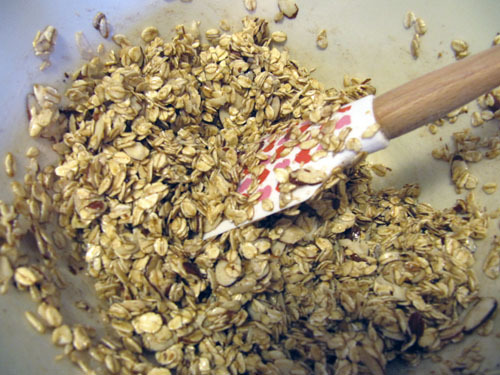 Add the warm, toasted oat mixture to bowl; toss well. Spray the foil on the used baking sheet with cooking spray. Return mixture to the pan and bake for 15-20 minutes or until golden brown. Cool completely in the pan on a wire rack. 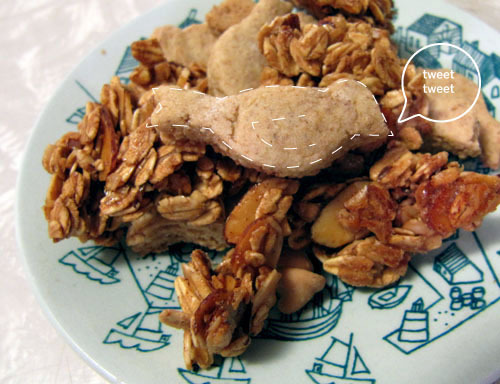 When cool, break the oat mixture into chunks; toss with mini graham crackers and peanut butter chips/chocolate chips. Store tightly at room temperature for 2 weeks. 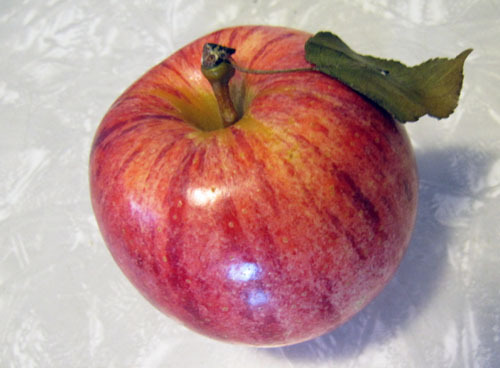 I met this pretty apple over the weekend. Snow White-ish, right? Seriously, though. I stumbled upon your blog a week or so ago, and I love it. Keep it up!